If you have been wanting to buy the Yocaher longboard but have been just as equally reluctant due to the risk of regretting it later, then you have just stumbled upon the right article, my friend! You do not have to buy it to understand its worth; that’s what I am here for! In our article today, I will put forward the best, most thorough and the most honest review of the Yocaher longboard for you. You will have access to all of its features, pro and cons, and a lot more information on it so that you can make the sanest judgments and decision based on our review. Let’s find out if the Yocaher longboard has what it takes to be your next longboard! The Yocaher longboard is designed to be a longboard alright, but it they also classify it as a professional grade skateboard with great speed capabilities. As contradictory as it sounds, it is therefore, both a longboard and a skateboard. Although I must say, it looks nothing like a mainstream skateboard; it does not have the rounded nose and tail ends of the deck. So yeah, if Yocaher has pulled off merging a longboard and a skateboard into the same body, then hats off to them because it’s not as easy as it sounds. The one will are looking at today is the “getaway” longboard from the series. However, you have 15 more to choose from; each with their individual personalities and design! Who doesn’t love choices? Let’s move on to the main features of the Yocaher longboard now. The Yocaher longboard is just heavy enough to function as a wholesome longboard, yet lightweight enough to almost double as a skateboard. It uses drop through trucks and has a deck measuring 40 inches in length. One thing to keep in mind is that beginners may have trouble using the Yocaher longboard at first since its drop through trucks can take it to some very high speeds. But controlled and safe practice should help the unconfident hopeless catch up without a problem. The deck used on a longboard is one of the most important components used on it. It dictates a lot regarding balance, stability and user comfort. 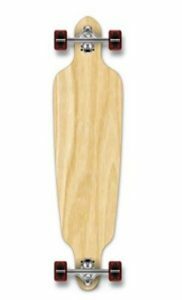 The Yocaher longboard uses a 40 inch long deck made out of high quality Canadian Maple; 9 layer of it to be exact. 40 inch is long enough to serve you well as a downhill board since longer boards give you more stability. You have 10 inch width; enough room for your foot. Now, one thing about these decks is that they are highly concave and are low flex. This curvature and low flex designs give the user that much needed control during carving and sliding at higher speeds. Speaking of higher speeds, your longboard is going catch speed pretty quickly on downhill and depressed roadways; this is where the drop through trucks comes to use. Drop through trucks are basically the trucks attached to the deck through a cutout of slit. This design, very unlike in skateboards, eliminate the distance between the deck and the ground, and the lesser the distance between the two, the more stability you enjoy; especially at high speeds. Oh and more thing, the deck is blanketed by a Black Widow premium grade 80A black grip paper for extra hold. The wheels on any longboard or skateboard are the very essence of it. Mess this up and all you have is a plank of wood. The wheels used on Yocaher longboard are 70 mm by 52 mm which is the ideal benchmark for wheels on a downhill loungeboard; it is also perfectly proportional to complement its 40 inch deck. The wheels have a hardness of 78A which also covers for normal and downhill cruising. Ceramic bearing are the end of all arguments. It is far more durable and heavy-duty. I will never understand why so many great brands resist it. And as suspected the Yocaher longboard also steered clear from it. It uses an Abce 7 chrome 9.7 inch bearings with 180 mm hangers made out of aluminum alloy. So, is it bad? Not at all. But definitely not the best. The Yocaher longboard, Getaway, looks exactly as it name says it would. It shows clear skies, crystals blue waters and white sands with 2 beach loungers surrounded my tropical green. It gives off a very vacation-ish and laid back Hawaiian vibe. However, the top of the deck is rather contradictory to the vacation feels. It is matte black and looks very bold and sleek. Very cool nonetheless. What is the weight limit on the Yocaher longboard? Answer: The weight limit should be around 250 pounds. How well does it turn? Answer: It turns pretty smooth, but if you feel like you could use more, then just loosen up the bearing a little bit. It is a good piece undoubtedly, but here are good problems with it too. First, It shows no signs that it can really, really after all, be used as a skateboard as it claims. But for me, the deal was instantly off when a good number of customers complained of the same problems: the wheels. If a longebaord can’t get its wheels right, I say start looking elsewhere. Now, the decision is yours. This concludes our review today; I hope you learned a great deal from it enjoyed reading along too. For more detail, click on the link of the product I mentioned for you on top of the page. Until next time! My wife and i felt quite glad Edward managed to finish off his investigations out of the ideas he made from your weblog. It’s not at all simplistic to just be releasing guidelines that the rest could have been selling. We really do understand we have the writer to appreciate because of that. All the illustrations you made, the simple web site navigation, the relationships you help foster – it’s got most overwhelming, and it’s aiding our son and us do think this subject matter is entertaining, and that is really important. Thank you for everything! I want to express my affection for your kindness giving support to women who must have assistance with this matter. Your very own dedication to passing the solution all-around had been amazingly valuable and have without exception enabled employees like me to attain their dreams. Your personal warm and friendly advice can mean a great deal to me and a whole lot more to my office colleagues. Thanks a ton; from all of us. The following time I read a blog, I hope that it doesnt disappoint me as a lot as this one. I mean, I know it was my option to learn, however I actually thought youd have one thing fascinating to say. All I hear is a bunch of whining about one thing that you might fix if you happen to werent too busy looking for attention. Thanks for another informative web site. Where else may just I get that kind of information written in such a perfect manner?